The new year always begins in the most positive of ways for us as we celebrate our youngest girl’s birthday at the start of January. I can’t think of a better way to bring colour and joy to the greyest of months. This year, she turned nine years old. Nine years of my little ray of sunshine being in the world. Nine years of giggles and twirling and curls and smiles and squeezy cuddles and enormous amounts of love. Looking back at the photos from Lola’s birthday last year, she seems to have changed so much in so many different ways. Twelve months can make a big difference. It’s felt like it’s been a year full of navigating complicated emotions with her: there have been little notes full of anger and sadness left on my pillow for me to read; struggles with sensory issues around the clothes she feels comfortable wearing; small acts of defiance such as other people’s belongings going missing, hand cream being squirted into beds and sneaking chocolate from the kitchen in the middle of the night. It’s been a little challenging, though I think we’ve got through most of it as gently and sensitively as possible. You’d think after having been through it twice before I’d know what to expect of this age by now, but each of the girls has been so different from the one before that it’s felt new every time. Aside from these slightly tricky moments that we’ve had to help her manage, it’s been a joy to see her become more of the remarkable little human that she already is. She’s always had a big heart – this year it seems to have grown even bigger. Her love of singing and dancing has really developed and watching her explore the things she loves to do, gradually increasing in confidence as she does so, has been wonderful. Her birthday always falls in the Christmas holidays, the quiet lull between new year and the return to school & work. This year it happened to be on the husband’s day off from work and she was thrilled to have him home all day – the ultimate treat. The morning was spent opening her birthday cards and presents. She is always so incredibly grateful for everything she receives, making sure to read every word in every card. This year she took to exclaiming “I love it!” after carefully unwrapping each gift and she truly meant it every single time. I wish I’d captured it on video so I could re-experience her joy over and over again. She had a brand new party dress: cream and twirly and covered in gold star sequins. 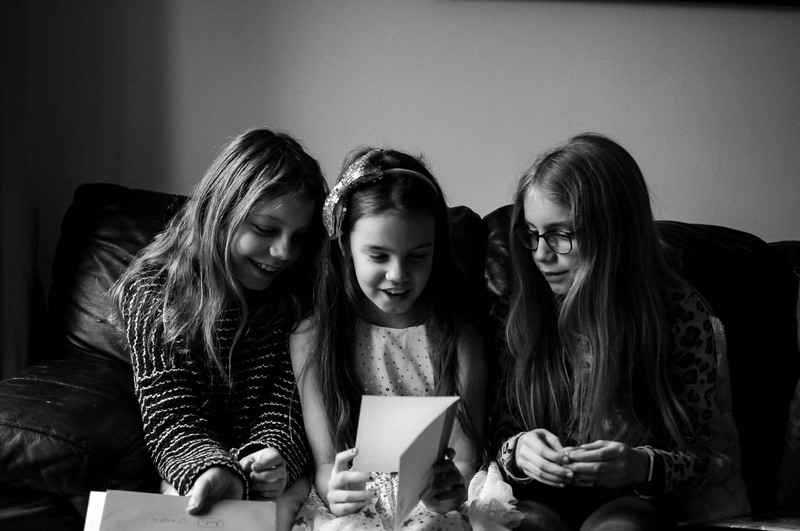 Mimi, a self-proclaimed tomboy, found it for her whilst we were out shopping one day and Lola instantly fell in love with it – her sister picking it out for her made it even more special. Unicorns seemed to be the theme this year: unicorn slippers; a mug that says “I believe in unicorns”; a cuddly toy unicorn; unicorn cupcakes to bake; a new unicorns-and-rainbows duvet set for her bedroom; unicorn books; a unicorn canvas to go on the wall… A definite graduation from the My Little Pony theme of last year, though that did still have a token presence. Her favourite gift by far though was her microphone and hearing her sing along to her ‘Trolls’ and ‘Moana’ CDs in her bedroom is just magical. I absolutely love this photo! Lola is an expert hugger and the expressions on their faces make me smile every time I look at it. Because we knew we would be out celebrating with her friends in the afternoon, we decided to do her birthday cake in the morning. All the usual rules go out of the window on birthdays in our house, so eating cake just after breakfast is completely acceptable. Her cake, too, was unicorn themed and she was absolutely thrilled. Everyone declared it to be utterly delicious. 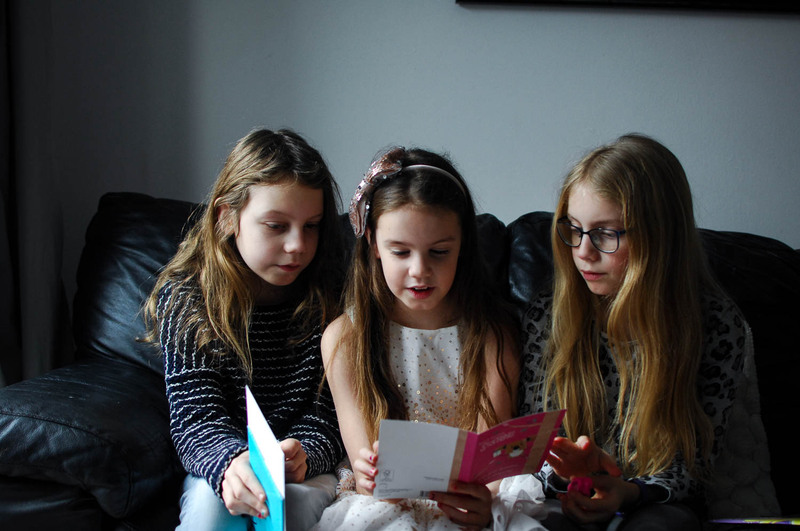 The birthday girl with her sisters – they all look so grown up in this photo though I’m sure in a couple of years I’ll look back and marvel at how young they seem to be! We spent the afternoon at Come Into Play with two of her friends, before returning home for takeaway Pizza Hut pizza for tea, a special request. I lost count of the number of times throughout the day that she threw her arms around my neck or waist and whispered (or squealed!) in my ear: “This is the best birthday EVER Mummy!”. Her happiness is contagious – you can’t help but smile along with her. Look at the joy on her face! I asked her to answer each of the following questions – I want to document them as they change for each of the girls over time. Every single day Lola, purely through being herself, teaches me to be kinder, more thoughtful, more caring and more gentle. She shows me how to wear my heart on my sleeve, how important it is to feel deeply and love fiercely and give hugs away freely. I’m immensely proud of who she’s becoming. She has her heart set on working as a primary school teacher when she’s older and I know with absolute certainty that she will be an awesome one. This time next year she will be in double figures and then I really won’t have any babies left. So I’m going to spend the next twelve months soaking up as much of her as I can whilst she still lets me, sneaking in cuddles and kisses whenever I can get them. 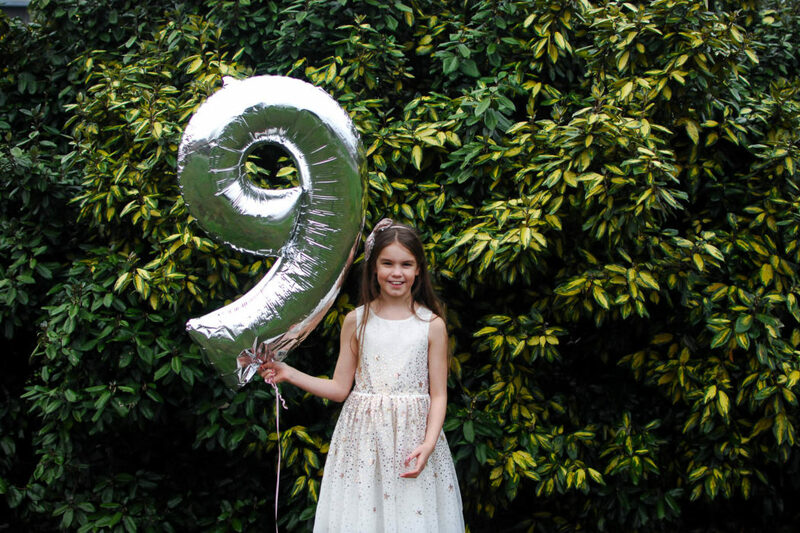 Happy ninth birthday Lola – we love you more than you will ever know.